Discount busline Megabus will be operating double-decker buses on it’s Boston to New York route starting today. 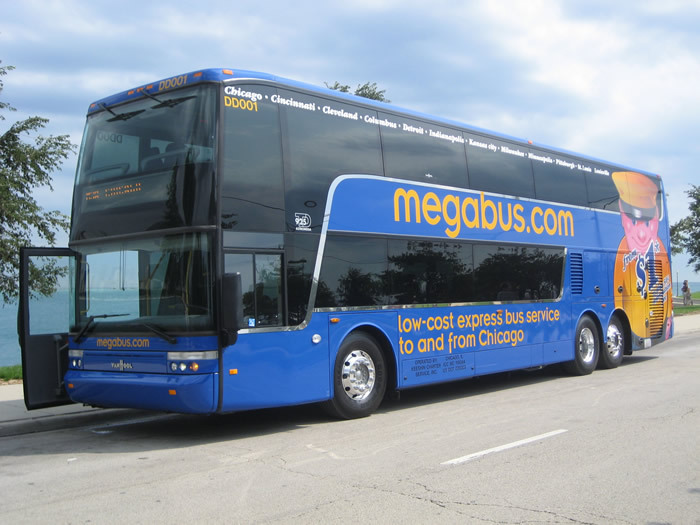 Megabus offers tickets for as low as $1. As the date of travel gets closer and the bus fills up, ticket prices rise, to about $18 on the Boston to New York route. Dale Moser, CEO of Megabus tells The Boston Globe that the double-decker buses make sense both economically and environmentally. The buses carry 25 more people than a conventional coach without the need run more buses or hire more drivers. Moser tells the Globe that the buses are 4 times more fuel effecient than a conventional coach. It is unclear to me from reading the article if that is on a per passenger basis, or if the coaches themselves are somehow more fuel efficient. Megabus plans to convert it’s entire fleet, which serves much of the Midwest, Northeast, and Ontario in Canada, to double-decker buses. Now the question is, how do we get these buses to stop in Providence and how do we get them to do a Providence to Cape Cod route? That’s great news. I wonder if they really have an interest in Providence or if it is just a formality that somehow was required for an awkward reason ?!?! Not sure, but I’ll cross my fingers that we’ll get a cheaper and an alternative way of traveling between New York and Providence. The only “awkward” reason I can think of would be the need to have a registered business in a state in order to obtain operating rights… although I’m not thinking that is the case. In any event, I do believe there is a definite interest. Are you a frequent rider to NYC? If so, what don’t you like about your current mode? Gokhan… Peter Pan/Bonanza runs PVD – NYC express for around $80 round trip. It is generally 3.5 hours one way dependant on traffic. Peter Pan is $82 round trip. Greyhound is just $57 but runs very few non-stop buses; some take as long as six hours. The cheapest option is Gonzales Bus Line, which connects South Providence with Washington Heights for $25 each way, or just take a bus or train up to Boston to connect with Megabus or a Chinatown bus. All of which is true… however, I believe Gonzales runs Ford E-350 Passenger vans holding maybe 15 (hardly comfortable). All of Greyhounds schedules are “locals”, stopping at every major city down 95. To go to Boston ads another hour by going north to go south. Chinatown buses also make a “rest stop” enroute adding more time to the trip… of course that’s when their buses aren’t laying on their sides, or on the side of the road fully ablaze, or having their driver hauled off to jail for DOT compliance problems. If you like Megabus, you should check out BusJunction. It’s a search engine for discount bus tickets and includes all the major lines like Mega, Bolt, Vamoose, and Greyhound. If u want a ride that’s cheap, timely, in a super-clean vehicle with no lines to wait in, AND which will pick you up at your home in New York if you live above 135th in Manhattan- and WILL drop you off at your destination in Providence: For $25 cash, it’s the Gonzalez Bus Line. There are no stops during the trip- except at Micky D’s for coffee and to pee (not necessarly in that order); a stop to look forward to for a change. 8 riders were in the van on my trip. I’m sure that during the holidays it will pick up and might fit up to 12 comfortably. Well, I have the feeling I’ll find out. There are NO lines to wait in outside or inside vehicle. It took as long as it took for 9 people (including the driver) to get into the van and take off. Yes there are the bench-type seats but considering the up-sides of the trip, I wasn’t bothered a bit. I met the van outside their ‘depot’ uptown as I don’t live in their pickup area. For those who would do that also, I’d advise to arrive about 15 minutes earlier than they say, as you would be the last to ‘board’ and the other passengers will be waiting all eager to go. I really can’t see a reason to go any other way! Via con Dios my friends!